Large venues really push my physical and creative abilities as an event photographer. Just covering the main stage at the National Arts Centre would be enough to keep one person busy, but I like to throw a little extra into my work. Which is why I decided to do back-stage portraits at this years’ Cracking Up the Capital Comedy festival finale while simultaneously covering the sets of the wonderful stand-up comedians on stage. Cracking Up the Capital is a charity fundraiser supporting the Royal Ottawa Hospital and other community partners. The festival working hard (for ten years now) to dispel the stigma’s associated with mental health. Having dealt with my own mental health issues for years, and those of the majority of my family (I suppose I come by it honestly) shooting this event is a no-brainer for me. Not to mention I get a few hours of sold-out Canadian comedic gold. I’d rotate from side-stage views, trying my best to stay out of the audiences line of sight, to the aisles of the theatre. Stage lighting is so incredibly dark, even the spotlight, that there’s no other way to shoot these than with high ISO’s on your camera and fast telephoto lenses. There’s no opportunity for flash photography at these events, I wouldn’t want to either, so distracting for the performers, and many acts are dynamic enough to require a faster shutter speed to make sure they’re not blurred out. After my first pass I’d go backstage and get one of the performers who had already completed their set, I had the lighting ready to go and a rough outline of where I needed the talent to stand. Since I was shooting during another person’s set, I couldn’t actually direct my subjects, I just told them to face me, or play to the light, and pose however they liked. Everyone has their own idea of how they’d like to be perceived in photos it seems. 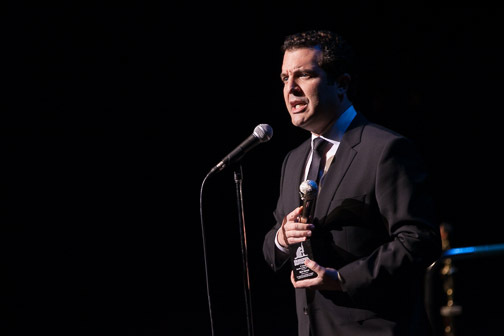 Rick Mercer was also on-hand to accept a lifetime achievement award for his work in comedy, and speaking out against bullying. He gave an impassioned speech that, I hope, will be remembered by everyone who was in attendance. You can see all the portraits, with lighting information, larger and on their own over on Flickr. Posted on Monday, February 10th, 2014 at 4:21 pm. 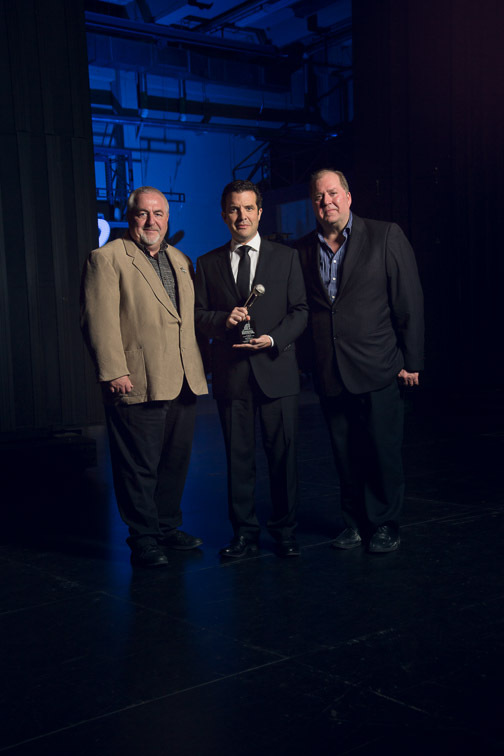 Filed under: Commercial, Events Tags: Comedians, Comedy, Cracking Up The Capital, Event Photographer, Mary Walsh, NAC, National Arts Centre, Ottawa Events, Patrick McKenna, Portraits, Rick Mercer	RSS 2.0 feed.